A very familiar name appears on the racecard at Killarney today – Piggott. Fortunately, it isn’t another comeback from the great Lester, but a debut for his 19 year old son Jamie. The new Piggott is a late starter; his dad had won the first of his nine Derby’s when just 18, his grandfather (Keith) was an apprentice jockey at the age of 12, and his great grandad, Ernie, was a well established jockey in his teenage years. Lester’s getting loquacious in his retirement! Coral have made up their minds about his possible achievements, and are offering 10/1 that he’ll be champion apprentice in Ireland before the end of 2015. They take a longer view on other markets, with odds of 50/1 for him to become UK champion jockey by 2018, and 16/1 to ride a UK or Irish Classic winner in that time. A Breeders’ Cup win looks unlikely; you can get 66/1 about him ever doing that. 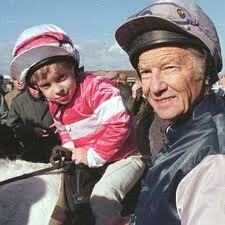 Spokesman for Coral, David Stevens, said, "Lester Piggott is regarded by many as the greatest jockey ever, and if Jamie has inherited a fraction of his dad's talent, he could well make his mark on the sport, and as bookmakers, we'll certainly be treating him with plenty of respect and will be watching his debut with interest."